Do you know what bad habits that bartender might have when making your drinks? If you pay $20 for a drink, are you really getting your money’s worth? In just a few hours, our Introduction to Bartending class will give you many of the answers you didn’t realize you had questions for. For more than 35 years, Fine Art Bartending has been training bartenders in Vancouver on how to best make up drinks. 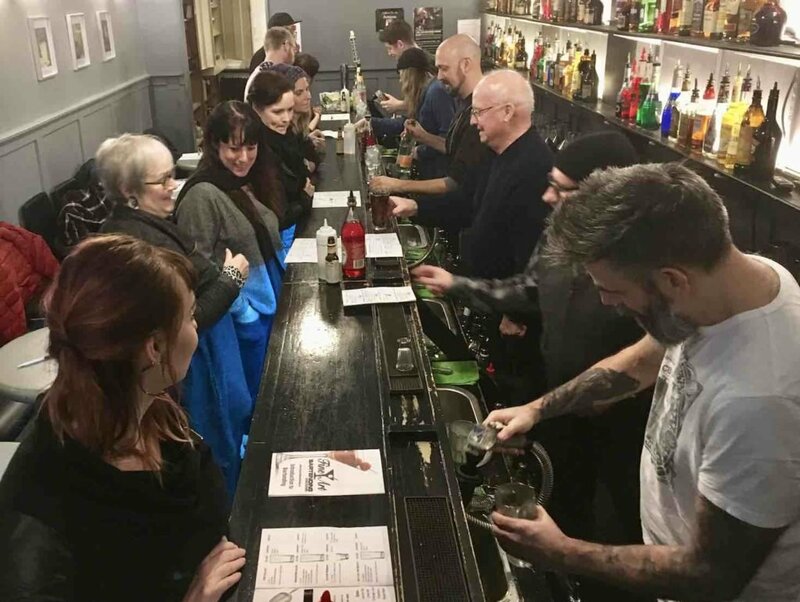 For this Introductory Bartending Class, our bartending instructor points out just what a bar, pub or restaurant might be serving you, plus what you really should be drinking instead. In just 3 hours, this cocktail seminar quickly introduces students to what really happens behind the bar. Each person gets up behind the bar to mix a couple cocktails, and also learns why that ideal margarita should be shaken or how easily a perfect martini can be prepared. Students finish the class not only knowing how to make a few drinks themselves, but also leave being much more knowledgeable customers. We also have a more extensive Bartender Certification Course that covers much more material over 32-hours of class time. During those classes, we cover many more cocktails, and have a bunch more practice time. We cover more history of each spirit, how to properly build each cocktail, and have a whole lot of fun. We offer that training program every couple of weeks. Classes are always more with a friend to share a few drinks with. My husband and I attended the Intro to Bartending class yesterday, and I wanted to let you know that we had a fantastic time! We were both a bit nervous of the content and how we would learn to bartend, but the class was exactly what we were looking for. Our instructor was easy going and approachable, while being tactful in correcting students. We tried the hands-on practice sessions and he pointed out how we should pour each drink. Even though I have limited experience with bartending and mixology I found the class easy to understand and follow. The handouts were were much appreciated and we are looking forward to hosting a party with our friends to try out what we’ve learned. We both agreed it was worth the drive. Again, I can’t say how amazing this introductory bartending class was. We are seasoned consumers of spirits and now know exactly what we should be purchasing the next time we go into a liquor store. We also now know the proper way to mix up a mojito. My girlfriend and I both enjoyed this bartending class a ton and have already recommended friends of ours. Thanks again! Now only $49 per person! Bring a Friend and Learn Some Fun Cocktails! If you are more into Wine, but want to know more… check out our upcoming Wine Tasting Seminars too. Only THREE seats left for Saturday May 11th!